Fun animal themed badge. 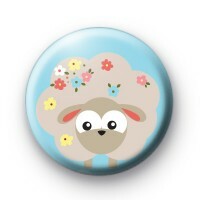 Bright blue 1-inch badge with a cute Spring Sheep in the middle, with lots of colourful flowers. This is such a nice bright, fun badge for both Spring and Easter and our badges make lovely cheap/inexpensive unusual and alternative Easter gifts. They're also are really good to use in goody bags at your Easter Egg hunt/Easter party. Although not as tasty as a chocolate egg but still a fun addition to Easter. We have so many sweet Easter designs and a few that can be customised with a name, so be sure to take a look at our Easter Category down the left-hand side. All of our badges are 25mm badges and hand made by us in our UK workshop.